A couple weeks ago we took a drive to the next county to check on one of our antique clocks. Most of our outings turn into adventures, this is no exception. We came across a sign that indicated an Indian grave site and we thought we would check it out. We never found the exact place but did find a sign telling about the Cherokee in this area. Historical markers tell the tale. Interesting link. ANYHOW, while we were driving around we saw this neat old church. After we looked at the church (from the truck) I had Charlie drive around the front of the driveway again. Something caught my eye. It was this fern, growing in the tree, green! in the beginning of February. I took pictures of the fern and tried to research it, thinking it was a tree fern. It wasn't so I did what anyone would do, send the pictures to my friendly fern expert. This fern is an epiphyte, growing on the tree but not taking nutrients from the tree. It is a Resurrection fern, Polypodium polypodioides. Amazingly it is hardy zones 6- 11. Floridata has some good information about this cool fern. Thanks Jim! I know what you are thinking, this is a tree posting, where is the tree? Well the fern was in the tree!! The tree was an oak, kind of gnarly...probably close to 100 years old. Turns out this was a Bur(r) oak, Quercus macrocarpa. The bark is gray to brown and in older trees the scaly bark becomes vertical longer ridges. 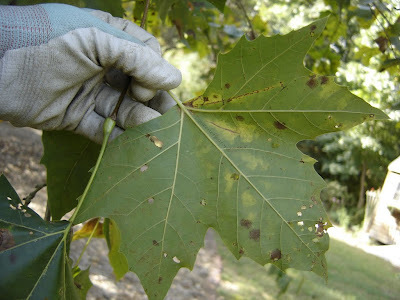 In making my identification I wasn't sure (100%) about my first assessment that it was a Bur Oak as the twigs have corky wings, similar to the Sweetgum or Winged Elm. From the photos I had, none of the twigs showed signs of corky ridges. 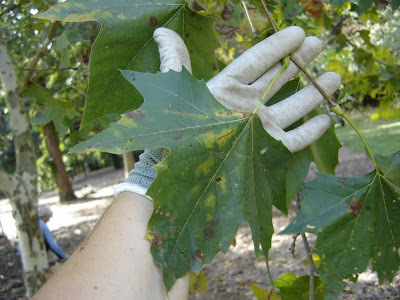 The leaves had rounded lobes, check. The Bur Oak is in the white oak family, rounded lobes. The leaves I am sharing are from last year, those who hang on to the end of winter. In the spring/summer I will go back and get some green leaf photos. 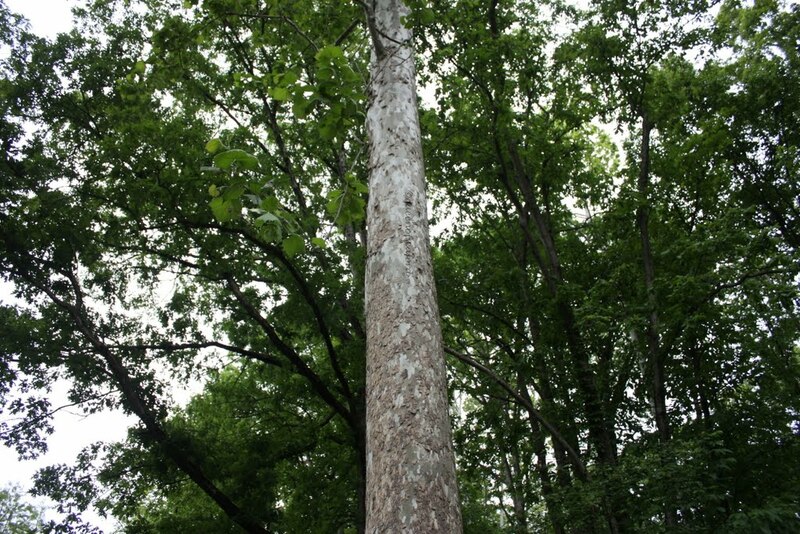 The leaves cluster at the branch tips, another white oak characteristic. Not impressed? Just look at the size of this acorn! This tree doesn't usually produce seed until it is about 35 years old, with the best years between the ages 75- 150 years. 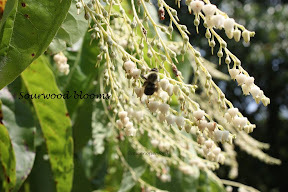 It can continue to produce seed/ fruit well into the 400th year. Pretty amazing. The mature size of this tree is 80 feet but there are some larger ones in the Ohio River valley. It is a slow grower and lives upwards of 400 years. 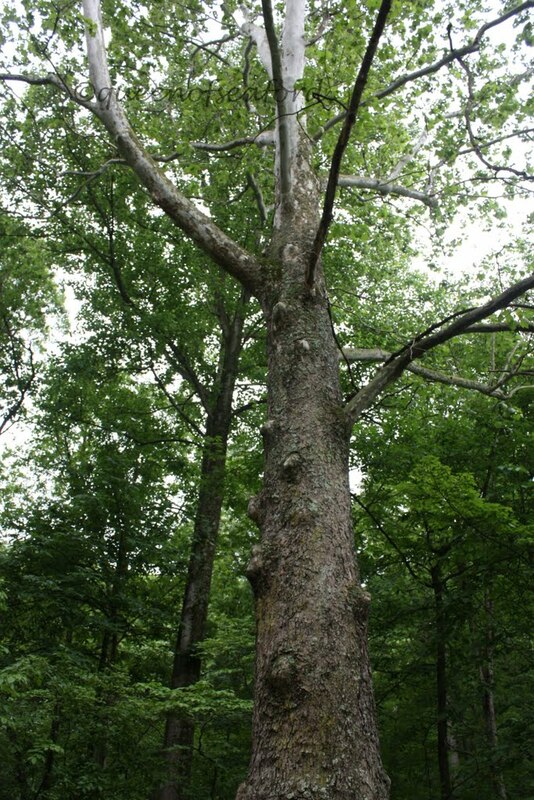 The shape of the mature tree is wide and spreading canopy and is a wonderful shade tree.The native range is the Eastern part of North America, though it was planted across the Great Plains. 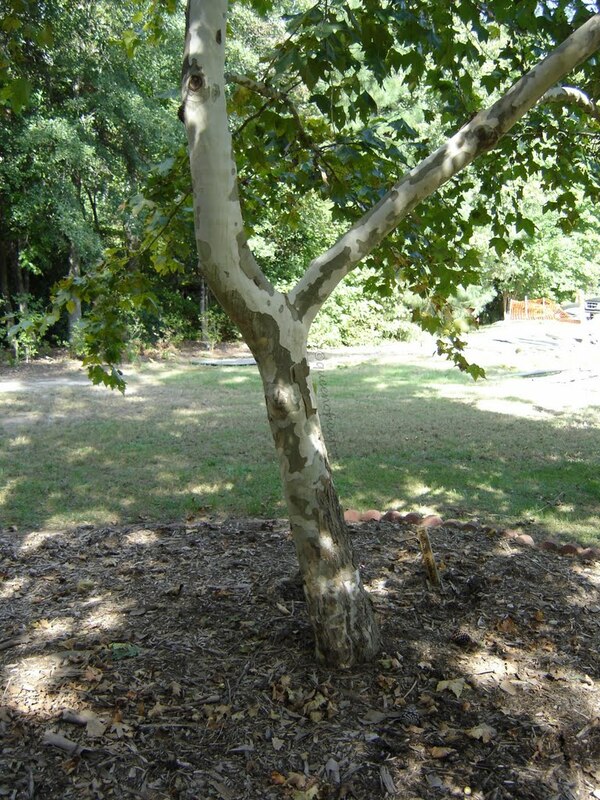 It is grown in various sights, depending soils, it could be a bottom lands tree or uplands or limestone ridges. The Silvics Manual has a detailed account of growing conditions. My other 'go-to' reference is VTech dendrology publications. 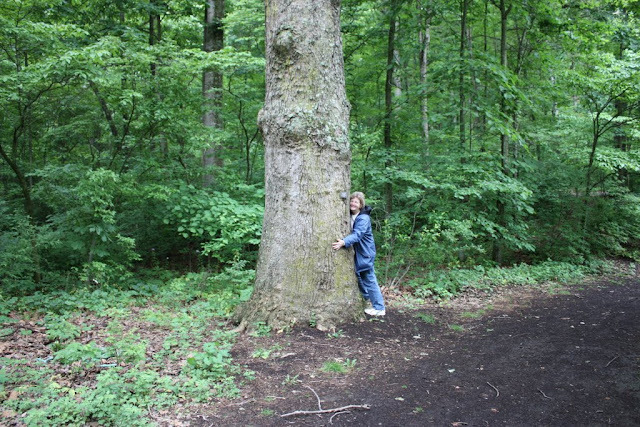 The wood is prized for lumber uses, often sold as white oak. The tree is a native though not really one of the south. It is hardy zones 3-8. After sourcing the fern to my friend in Virginia, I took the acorn to my Cooperative Extension agent, a forester. He confirmed it to be a Bur Oak. I was confused as its native range does not include South Carolina. He said either Indian migration could have collected acorns from native growth. Another possibility was that since the tree (and some of its friends) were planted in front of this church, so perhaps they were planted as specimen trees. Either way, they created a wonderful frontage to this old church. Next week, taking a tree break. Stay tuned for more to come. Each of the photos has a link to the original posting, I plan to post these pictures on the original post page as well. Good to have all the information in one spot. Each photo can be clicked on for a larger view. The White Oak has some great fall foliage color. With spring blooms like this you can understand why the bees like it so much. 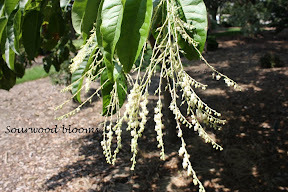 Sourwood is another red fall foliage tree, love it! I recently found out that the tops of the Deodora Cedar can freeze and leave the tree without a leader. There are many specimen like this in SC. 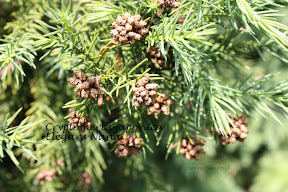 Before I left Virginia I found a nice collection of new cones on this Deodora Cedar on Fort Eustis. Pictured below are a couple hickory fall foliage trees from my backyard. 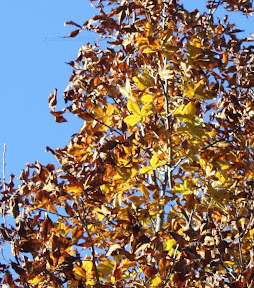 I have Mockernut, Shagbark and possibly Shellbark Hickories, so these photos could be other than the Shagbark from my posting, though they all have great yellow fall color. In my posting of the Chinese Pistache I was concerned about the reports of red fall foliage and ours having yellow. They can have either. Found a red one in the parking lot of the Costco in Greenville. For fall color I think I am in love with the Sassafras albidum. Who can resist the salmon, peach, orange, yellow, red and light green colors of this beauty in the fall? This grand tree was found in the South Carolina Botanical Garden at Clemson. 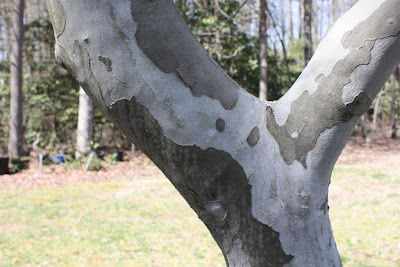 With its smooth bark the American Beech is a canvas for those who want to profess their love. someone came to join him in the tree top. ﻿Sadly we drove on towards the house......rounding the bend who did we see????? Yes!!! The pair of hawks. We were left to bird watch another day..................like today. On our way out we saw the Barred Owl -- think it might be the same one, but not sure. This is our third sighting of this type of owl. Charlie saw him first---do you see him? Amazing how well they blend in. Just a few more days until the Great Backyard Bird Count! Do you have lots of color in your garden?